Let me "Clareifi" - I lost my dad to Alzheimer's in the sense that he no longer recognizes me as his son. When he sees me now he says "Hey! It's my brother man!" or "Brother Me" or "Bro" or "Bro Maine" or "Hey Buddy". He sees me as a familiar face, one of his friends. On Monday, July 9th 2018 - I had to help mom take my friend to his new home... Dad is now a resident at The Ambrosio Guillen Texas State Veterans Home. Mom started looking into preparations for his move back in March, although I don't think that any of us believed that it was actually going to happen or that dad wouldn't fight it. It's going to take some getting used to for everyone (especially for mom & dad). Mom said that it's like a part of her identity, a part of who she really is... is now gone. This has got to be the hardest thing that my mom has ever had to do. But I know in my heart that it's the right thing. It's been taking such a toll on her. I read an article in healthline.com The State of Caregiving for Alzheimer’s and Related Dementia 2018 about how "caregiving for someone living with Alzheimer’s or related dementia is a harrowing ordeal. These individuals experience loneliness, grief, isolation, guilt, and burnout." check that box for mom! It went on to state that 59 percent of caregivers "report having anxiety and depression. 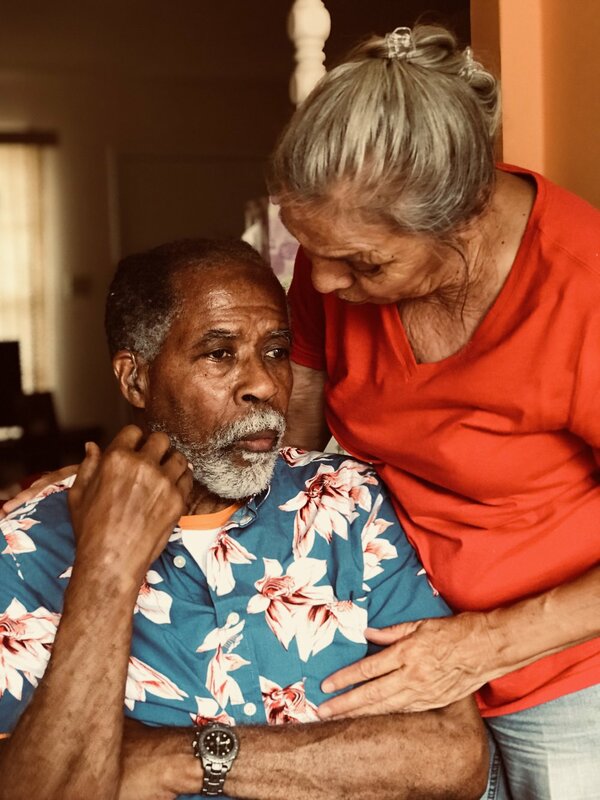 In the process of caring for a loved one, these caregivers often experience declines in their own health from the strain and pressure or simply not having the time to attend to their own needs." I supported and encouraged mom's decision to put dad in the home, because I am scared of losing both of them at the same time. When we left dad at the home, he was eating a lunch that they served him. He didn't look up to see where we had gone. Mom went to go sign paperwork, and I went to go get his medications, and a few of his clothes. When I went back to take him some of his books and magazines he seemed sad, yet... Understanding (somewhere deep inside he knows what's happening to him, and is working through it in his own way). He was upset and I could tell he missed my mom, although he wouldn't admit it until later when she went back to check on him, and he ran to her with open arms - ready for a hug. He asked her if he could go home with her just to sleep and then she could bring him back to the home. Mom had to tell him that he couldn't do that, but soon he will be able to make home visits, or take day trips, as long as we get him back by 8PM. We can try to make him feel safe and ensure he is being taken care of. We can let him know that he is loved! Now mom has the professional help that she needs to lessen the burden on her mental and physical health. We've been saying Goodbye (whether we realized it or not) since 2011 and still it seems like it all happened so fast! Now instead of saying Goodbye to my dad, I say "I'll see ya tomorrow dad". He says "alright that will be good, it's always good to see you buddy... my brother man... your a good man... don't get sick..." He leans to my mom and says "My buddy is a good man". She says "he's our son! ", dad replies "well I don't know about that". Ok dad, see ya tomorrow.